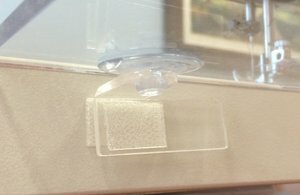 Acrylic bracket with one suction cup. Attaches to both a Sew Steady Table and sewing machine, and helps secure the Table to the machine. L BRACKET WITH SUCTION SECURES THE TABLE TO THE MACHINE FOR MINIMAL MOVEMENT WITH USE OF UNIVERSAL GRID, GUIDE, AND CIRCLE SEWING. As described, fit perfectly, excellent quality.